The new Galaxy S10 trio has been a hot topic for the past few weeks - they started shipping around the world and the first reviews (Galaxy S10+ review/Galaxy S10 review) are ready. 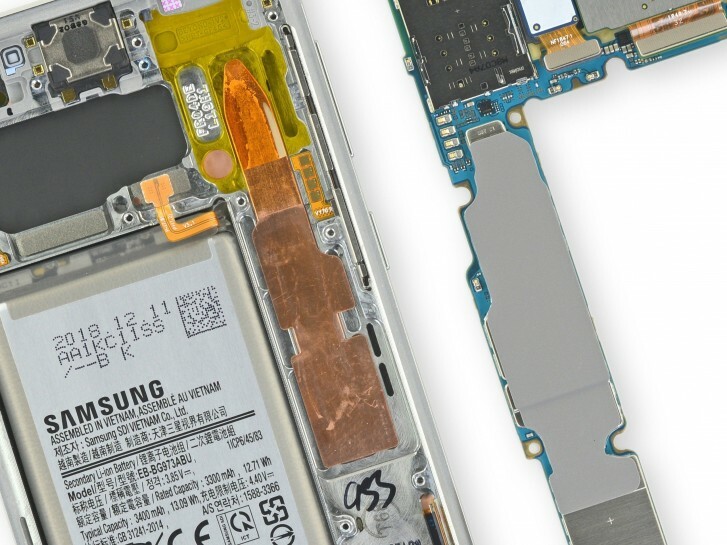 And now the time has come to take a proper look at the internals of the Galaxy S10+, Galaxy S10 and Galaxy S10e. iFixit serves us a complete disassembly of the three Galaxies. Before we dig in, the three Galaxies all got an abysmal repairability scores of 3 out 10 because the USB-C port is now soldered onto the motherboard, the battery is glued into the phone, just like the front and rear glass panels, and finally because replacing the screen requires almost all the components to be removed. In the image below you can see the graphene layer and extra coils used to achieve both wireless charging and reverse wireless charging. Those generate a lot of heat and Samsung engineers have equipped the Galaxy S10, S10+ and S10e with the most protection possible. 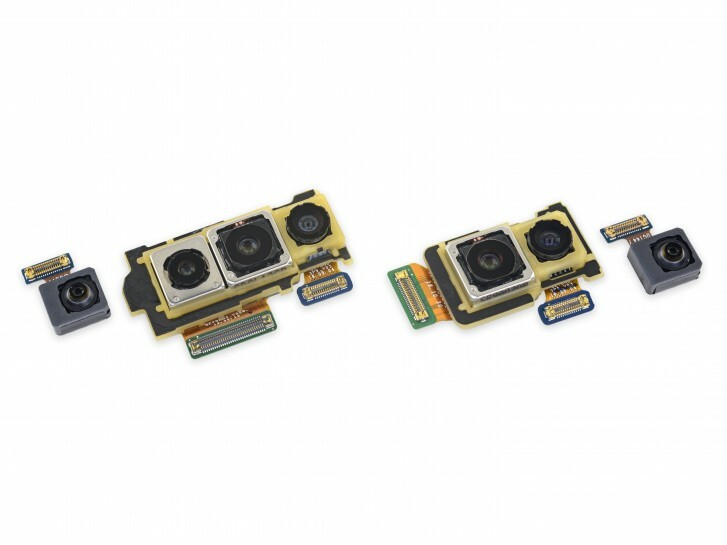 Below are the two camera modules - the triple 12MP telephoto, 12MP wide and 16MP ultra-wide camera of the Galaxy S10 and S10+ and next to it the 12MP wide and 16MP ultra-wide of the Galaxy S10e. And here is the new copper heat pipe used for cooling - iFixit notes that it's much bigger than the pipe of the Galaxy S9 and S9+, and more comparable to the heat pipe of the Galaxy Note9. And here's iFixit's own video of the disassembly of the largest of the three - the Galaxy S10+. Batteries should be soldered as well to drive down that message harder. People will continue to lap things up as usual. Who tf also wants to go through the pain of going to/mailing their phones a special repair centerand wait for hours/days just to have a battery replaced? Maybe you replace your phones a lot which is why you are ok with this crap.